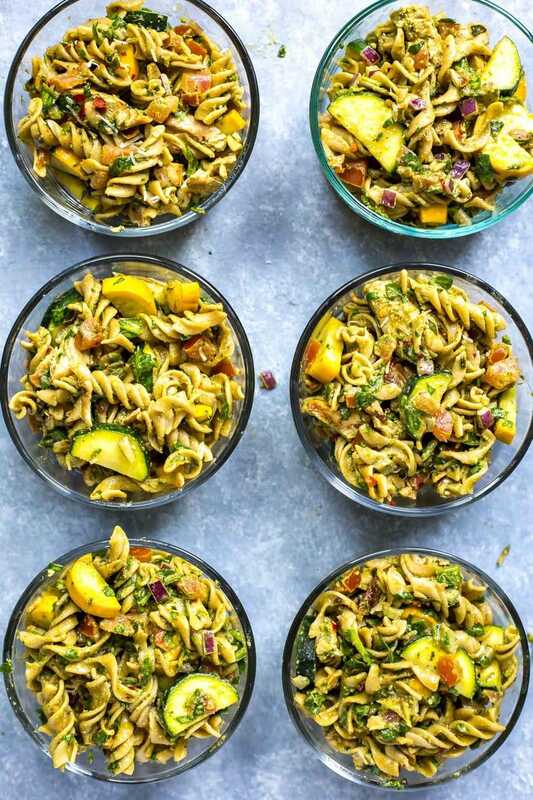 These Whole Wheat Summer Pesto Meal Prep Pasta Bowls are just what you need in your life for a busy workweek! Perfect for lunch on-the-go or as a quick, almost one-pot dinner, you can't go wrong with these flavours! 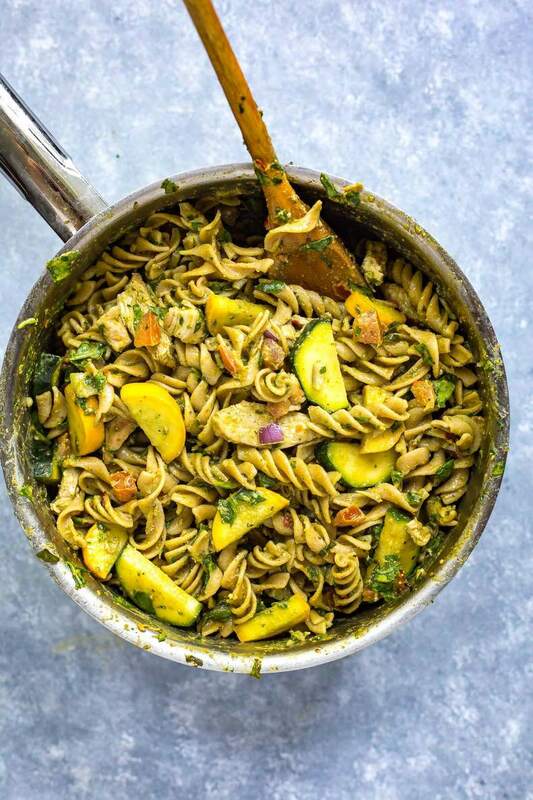 Whole Wheat Summer Pesto Meal Prep Pasta. What else can I say about you? I'm in love. 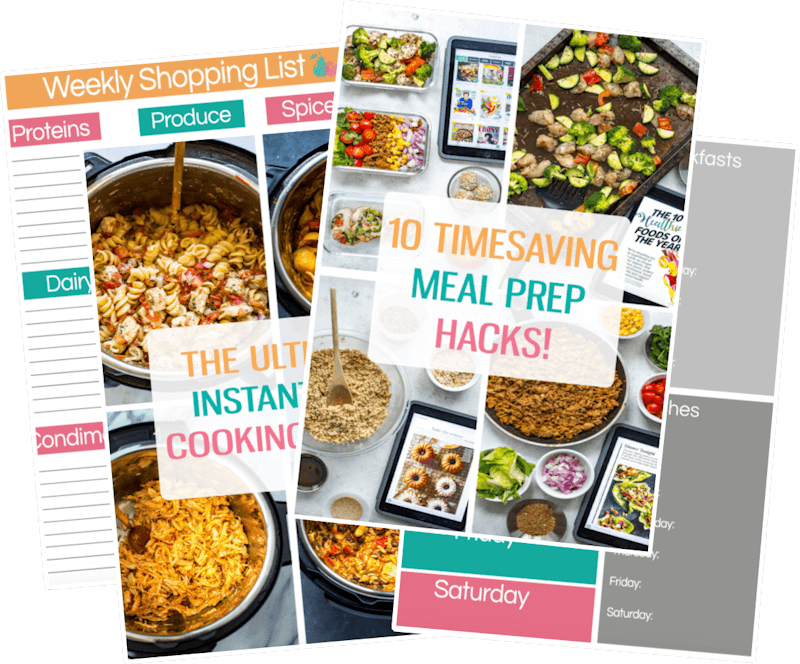 This is exactly the type of meal prep that will have you looking forward to lunch each day, and let's just say it's worth spending an hour cooking up on the weekend. Or even one day after work. Honestly, being prepared for the work week and not having to worry about your lunches makes life SO much easier. Can we talk about zucchini for a hot second? Maybe I've been under a rock the past few years and have just never noticed how HUGE these things can grow! I was having dinner with my grandma last week, like the good little granddaughter that I am (LOL), and out she comes from the kitchen with this massive half zucchini. An actual zucchini cut in half. My grandma is officially the most adorable old lady you will ever meet and this totally speaks to her frugal, never-let-anything-go-to-waste nature. To be fair, this half zucchini was actually the size of an actual regular-sized zucchini, so I guess she had her portion sizes right at least. Supposedly came from the garden of a friend of hers. I'd LOVE to see that garden! Anyways, what I'm getting at is that I have been loving all the fresh zucchini and summer squash I've been seeing in stores lately. And after so many years of trying to find them, I also saw zucchini flowers in my local Longo's the other day! Okay, this no sponsored post or anything but I really have to say how much I love that store. They're a local grocery store chain based in Southern Ontario with most locations spread between Toronto and Hamilton. When they opened their location in my small town, I was thrilled with the amount of local produce they had available. I'm talking fresh, local green beans, asparagus, strawberries, broccoli, potatoes, garlic (the purple kind!!! ), tomatoes and YES zucchini! 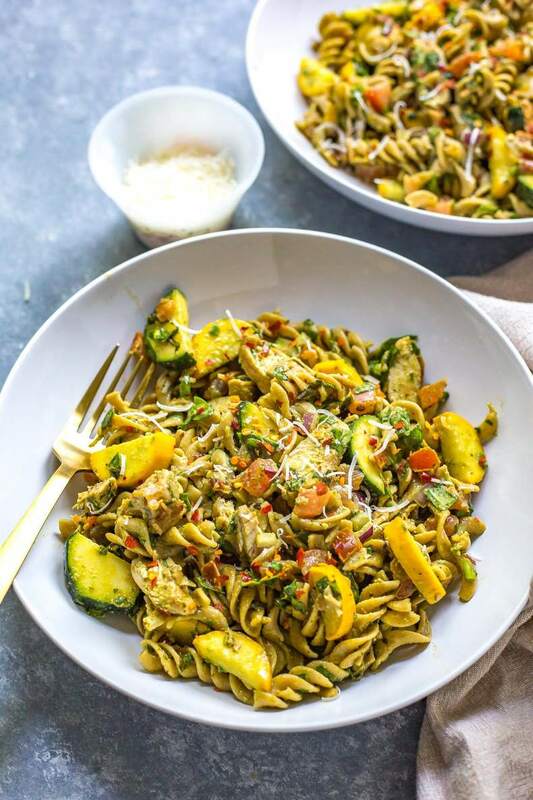 This Whole Wheat Summer Pesto Meal Prep Pasta is basically my dream when it comes to using fresh, local veggies. 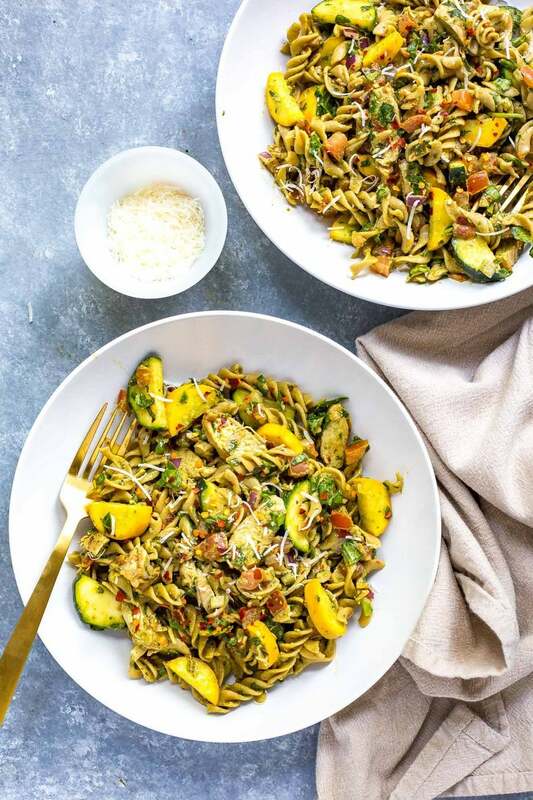 Zucchini, summer squash, spinach, plum tomatoes, loads of fresh Ontario garlic and a smattering of a quick basil pesto. If you're in a rush, use the jarred pesto from the grocery store but I'm telling you, fresh makes all the difference in flavour and really adds to the vibe of these meal prep bowls. 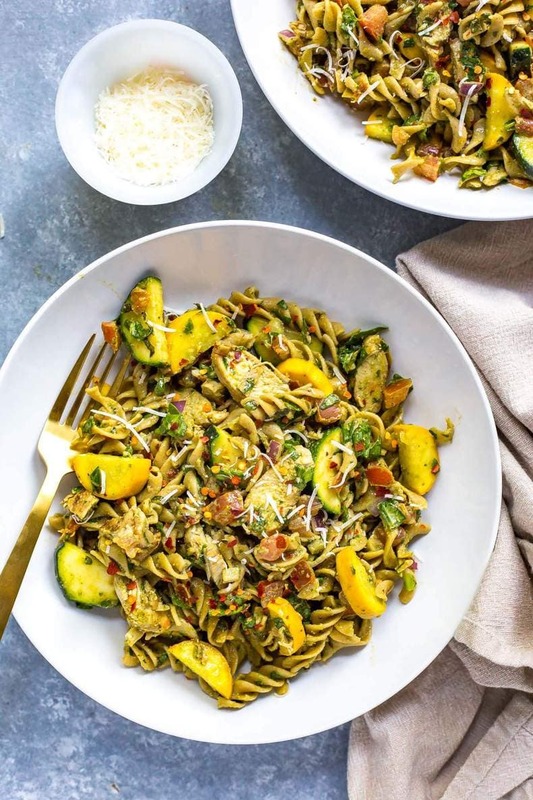 This recipe can either double as a classy summer dinner patio-side (you might even wanna serve it up with a crisp, chilled white wine) and it certainly makes a TON of food for the work week ahead. Depending on how much you can eat at one time, this recipe either makes 4 or 6 servings. I know I was able to fit it all in 6 smaller-sized glass meal prep bowls that I got from Canadian Tire (you know the ones that go on sale every so often?) and it was more than enough of a serving, especially if you use high quality whole-wheat pasta. It's definitely more than enough for lunch anyway. You don't wanna have a food coma the whole afternoon! 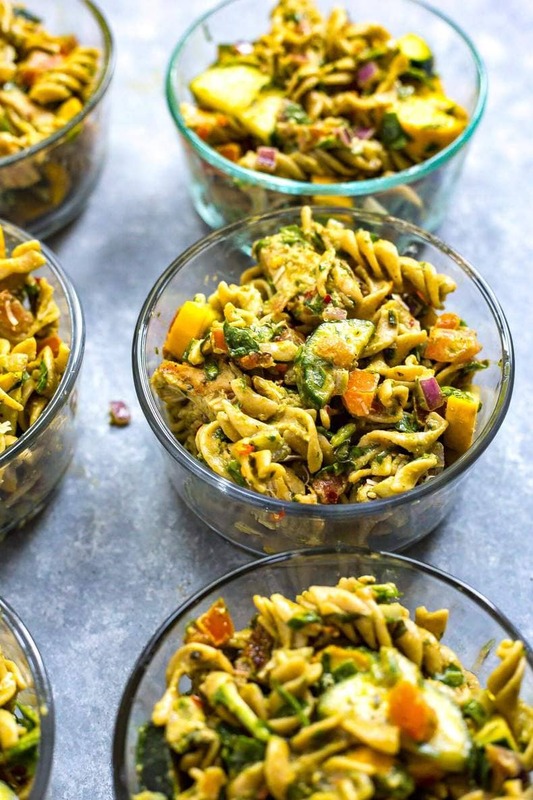 This Whole Wheat Summer Pesto Meal Prep Pasta takes about 45 minutes to pull together, but batch cooking like this is so worth it in my book. Especially when you have something delicious to enjoy every single day of the week! I also love including fresh plum tomatoes in pasta. Honestly, there's something about the fresh, juicy flavour they add to pasta when sautéed with some olive oil and garlic. I've never been a fan of chunky tomato sauces or recipes that require you to use canned diced tomatoes. I always end up buying crushed tomatoes or passata (strained, jarred tomatoes) because I just can't stand the chunks. But fresh plum tomatoes cooked down into a sauce and mixed in with other veggies? Count me in. You're going to want a million bowls of this. 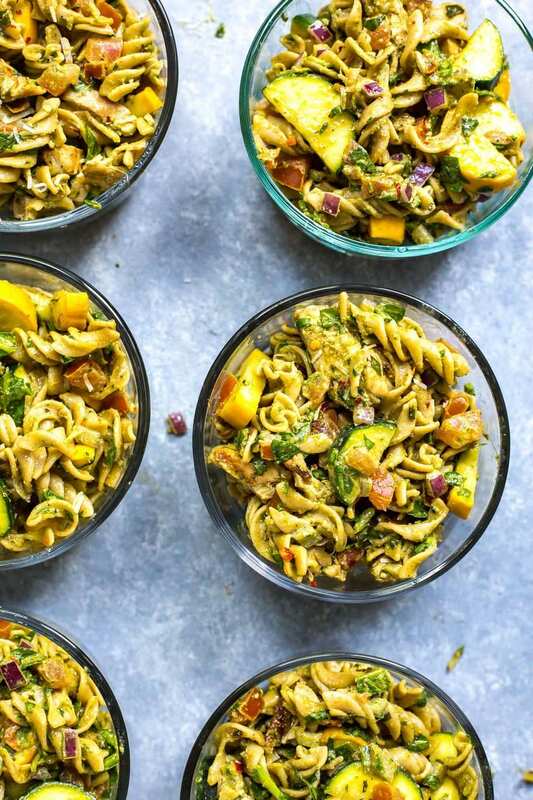 Will you be making these Whole Wheat Summer Pesto Meal Prep Pasta Bowls? In a large skillet, heat olive oil over med-high heat. Add chicken to pan, sautéing for 6-7 minutes. Meanwhile, make quick basil pesto by adding all ingredients to a blender or Magic Bullet. Cook pasta in boiling water until al dente, about 10 minutes. Reserve 1/2 cup of pasta water and drain pasta, then set aside in a strainer. Return pasta pot to stove over med-high heat. 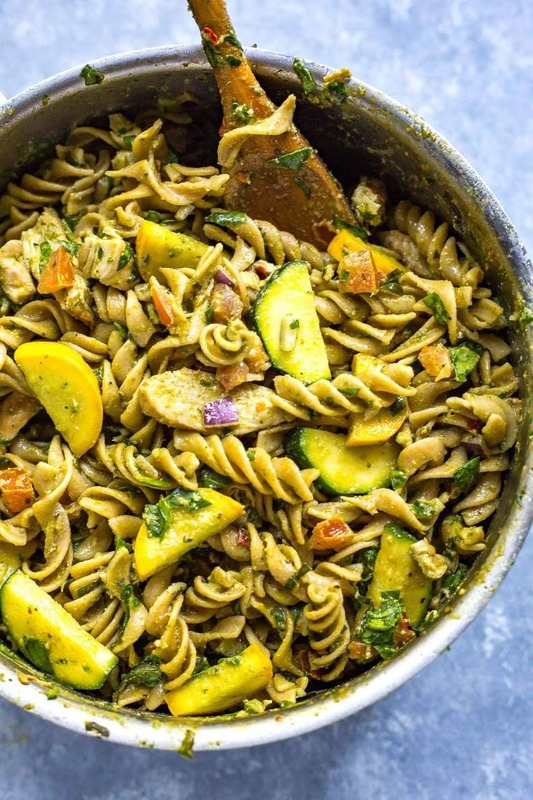 Add remaining tbsp of olive oil to pot, then add tomatoes, zucchini, yellow squash, red onion and garlic. Saute for 3-4 minutes until veggies have softened. Add chicken, pesto and pasta to pot, stirring well to coat and cooking for another 2 minutes or so. Stir in chopped spinach and cook another minute or so before removing from heat. Serve in small glass bowls - this was enough for 6 servings for me personally as I find I get filled up on pasta easily, but if you're really hungry, this serves 4. Enjoy! Is the nutrition info if you make it 6 servings or 4 servings? This recipe is amazing. I prepped 4 lunches and am eating the “extras” tonight for dinner. Definitely a keeper. Thanks so all these recipes. 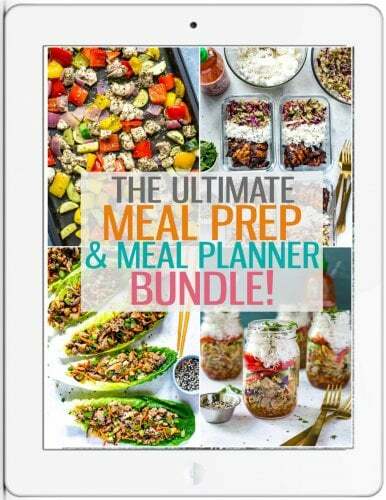 You keep my meal preps very fun and I look forward to my lunches every day. This looks delicious!! If using pesto from a jar, how much do you suggest?? Thx!